In an important step toward the development of practical invisibility cloaks, researchers have engineered two new materials that bend light in entirely new ways. 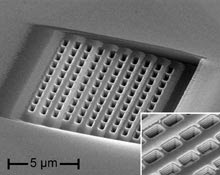 These materials are the first that work in the optical band of the spectrum, which encompasses visible and infrared light; existing cloaking materials only work with microwaves. Such cloaks, long depicted in science fiction, would allow objects, from warplanes to people, to hide in plain sight. Both materials, described separately in the journals Science and Nature this week, exhibit a property called negative refraction that no natural material possesses. As light passes through the materials, it bends backward. One material works with visible light; the other has been demonstrated with near-infrared light. The materials, created in the lab of University of California, Berkeley, engineer Xiang Zhang, could show the way toward invisibility cloaks that shield objects from visible light. But Steven Cummer, a Duke University engineer involved in the development of the microwave cloak, cautions that there is a long way to go before the new materials can be used for cloaking.